QMOBILE introduces in year 2016 phenomenal Smartphone for its valued buyers all over the Globe. This is an amazing hand-set has launched and now days we are watching electronic advertisement of this hand-set with super star of Pakistan Mahira Khan. This hand-set is giving quality of incentives and features for using through this cellular phone of its buyers. It gives Android Marshmallow System along with speedy processor Quad-Core 1.3 GHz. QMOBILE is providing dual SIM option in this hand-set for using two SIM connections in a same time. It is giving 1GB RAM along with 8GB built-in memory feature. The best thing in this hand-set it is providing same mega pixels front and rear camera option of 5.0 mega pixels. Users can capture high quality selfies by using front camera option of this Smartphone. QMOBILE always brings different cellular phone with reasonable charges and it is also giving cheap price of this hand-set with multiple qualities of incentives. The hand-set look is truly amazing and beautiful and cellular operators easily attract for getting this Smartphone for using. It is also giving various smart incentives like Bluetooth, Multi-touch, FM Radio, Wi-FI, 3G and many other more options. This is prefect Smartphone design by QMOBILE for its valued customers and now you can easily get Smartphone in yours hand for using in daily by buying this product. 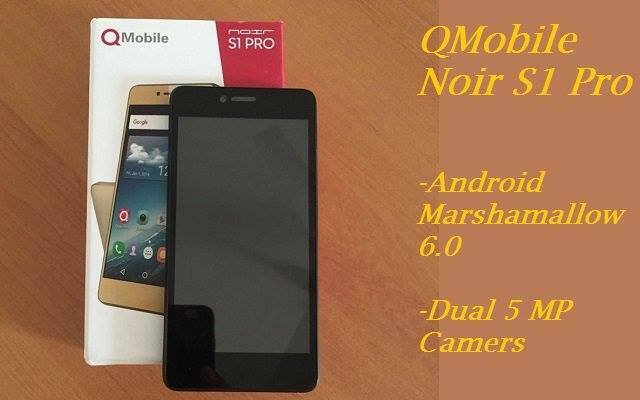 The further QMobile S1 Pro specifications are mentioned as below. Rear Camera: 5.0 Mega Pixels. (LED Flash). Display Pixels: 720 x 1280. Display Colors: IPS capacitive touch display and 16M Colors. Bluetooth, WLAN, Wi-Fi direct, Wi-Fi Hotspot, USB, GPRS and EDGE. Audio: FM-Radio, Mp3, Mp4, 3.5mm audio jack, WAV Player and Other audio players. Ringtones: Polyphonic tones, Mp3, Downloadable, Sound-recording and WAV Files. Other Features: Multi-touch screen, GPS Support, A-GPS Support, Micro SD support up to 64GB, Speaker-Phone, Video Recording, Rounded body. Latest Features: Proximity sensor, Best Selfie Camera, Long-Battery Standby, Google Maps, Touch-Focus Camera. Available Colors: Black, White and Grey.